Frost-free defrost systems, Energy Star qualification, reversible-swing door, fast freeze setting, a durable textured steel cabinet and front leveling legs. As well as the features you’ve come to expect from a standard upright freezer model: adjustable temperature control, removable wire shelves, deep door shelves, and a smaller footprint than a chest freezer. Here is what you can expect from each of the Maytag freezer uprights. 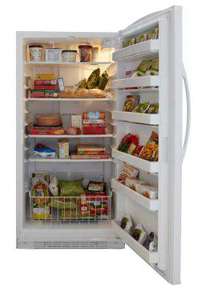 The Maytag upright freezers come in 2 capacities: 15.8 cu. ft. (MQF1656TEW) and 20.1 cu. ft. (MQF2056TEW). 1 freezer floor shelf with a built-in storage gate. 6 fixed full-width door bins provide even more storage room for the tiny items that would otherwise lie buried at the back of one of the wire shelves. 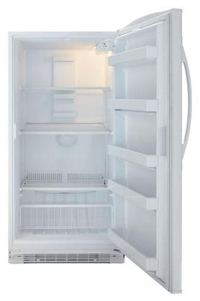 While they are probably not a good choice for anyone looking for a compact upright, these Maytag freezers are excellent for a family with medium and large freezing needs. Both the 15.8 cu. ft. and 20.1 cu. ft. upright freezers from Maytag are frost free. In other words, these freezers have a fan that periodically blows warm air to melt any ice build ups. That way, you don’t have to worry about emptying the contents of your freezer and then enduring the tedium of manually defrosting it. Both the Maytag uprights come with a fast freeze feature. 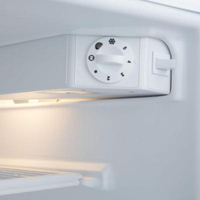 This allows you to freezer large amounts of food quickly. As such, it’s great for locking the juices in newly loaded food items, keeping them fresher longer. This is because they consume appreciably less electricity than other identically sized upright freezers. Consumption of less energy doesn’t just help to lower electric bills and save you money in the process, it also helps to protect the world’s fragile environment. The Maytag upright 15.8 Cu. Ft. and Maytag upright 20.1 Cu. Ft. freezers come with bright, 40-watt interior lighting. This makes it easy to play detective with tiny food packets that are intent on playing an ill-timed game of hide and seek with you. Both the 15.8 and 20.1 Cu. Ft. Maytag upright freezers have textured steel cabinets and doors, virtually assuring you of many years of reliable service. The liners in both models are rust- and impact-resistant. This means that the freezers won’t buckle under the weight of frozen food. So with their sizable capacities, you can load them with your favorite food with abandon. Well, in the case of the Maytag freezer uprights, the manufacturers undertake to remedy, within a year of purchase, defective parts and workmanship that existed when the appliance was purchased. So be sure to keep your receipt. 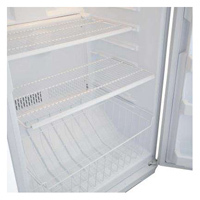 For the warranty to hold though, the upright freezer has to be used for single-family household use so using any of these freezers for commercial uses voids the warranty. Your best bet for buying a Maytag upright freezer is Home Depot. This retailer of home improvement and construction products and services offers both the 15.8 and 20.1 cu. ft. upright freezer models. What’s more, Home Depot offer free home delivery and basic installation on both models. A nice bonus is that they will also haul away your old freezer for disposal, free of charge. All you need to do is unplug and empty your old freezer. Frost-free configuration, energy efficiency, bright interior lighting, upfront controls, and a reversible swing door. These features are all encapsulated in durable textured steel cabinets. Few other brands offer a comparable raft of benefits on single freezer models than the Maytag upright freezers.